Retailers may have dozens (or even hundreds or thousands) of links across the Web. The problem, however, is that those links may be promoting or directing Web surfers to landing pages that have out-of-stock products. 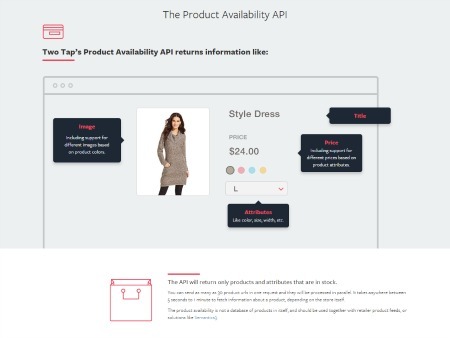 Two Tap, a universal shopping cart, has announced the launch of its new Product Availability API, which may significantly improve both the user experience for shoppers and link management for retailers. Before the new API, consumers would often add products to their mobile app or shopping sites only to find out they were not in-stock (such as from Pinterest). This new automated product inventory solution will only return products and attributes that are in stock. This reduces, or in some cases eliminates, friction on the way to checkout (or conversion). Plus, it prevents prospective buyers from having a negative experience on a retailer's site.